We rounded up our favorite cufflinks finds back in the day, but more have popped up that must not be ignored! I'm pretty sure cufflinks are one of the most versatile accessories ever. 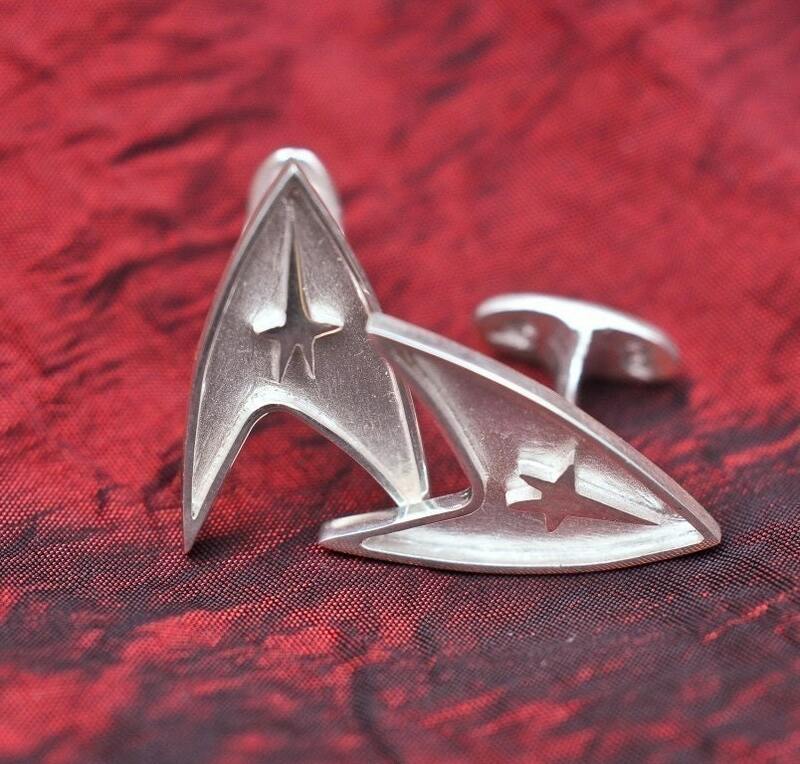 Gamers, geeks, goths, groomsmen… there is a pair of cufflinks with your name on it. And one of them just might be in this here collection. Not idly do the cufflinks from Lord of the Rings fall. You'll hold tight to these cufflinks made from Middle Earth maps. Dragons! Shields! A renaissance wedding needs these cufflinks. Game controller cufflinks for that gamer boy or girl in your life. Vintage tattooed man cufflinks for your own tattooed partner? Na na na na na na na na cufflinks! The robot uprising starts with these cufflinks… in the distant future. Honor one of the most awesomest of movies with these Ghostbuster cufflinks. We've got you covered, Apple fankids. Do not fret, Linux users! I didn't forget you. Double Dragon cufflinks! Retro gaming awesomeness. Just in case you're directionally challenged, these compass cufflinks will steer you in the direction of the wedding. According to my calculations, math geeks will love these Pi cufflinks. This poster may be super popular, but it's pretty appropriate for a wedding day. A tuxedo isn't complete without a little Bond…James Bond. Role players unite in your love for these D20 cufflinks. Bouquets get all the glory for being the bearer of memorial photos. Let these photo cufflinks have some time in the spotlight. Get a little captain in ya on your wedding day. Err, Captain America, that is. Wear your heart on your sleeve, literally, with these anatomical heart cufflinks. I'm pretty sure my dad would love these fishing cufflinks. BONUS CUFFLINKS! Celebrate the absurdity of The Simpsons with these pig bride and groom cufflinks. Are you or your partner planning on rocking some cufflinks on the big day? If so, what kind? I like this post. I am getting married in April and have been trying to decide on what cufflinks to get. I have ultimately decided to go with the Death Star ones. We are having a formal wedding and these will be a discreet bit of fun. They make me think of Peek-A-Boo ties. Flight of the Conchords shoutout woohoo! My hubs-to-be bought transformers cufflinks. They are SOO COOOOLLLL! I just bought the Lord of the Rings ones! FH will love them. There are so many awesome cufflinks out there that it almost makes me wish I could wear cuffs with my dress just to put links on them :p My guy decided on lego stromtroopers wearing tuxedos! I'd like to add these, for all mt Trekie hommies. See I want to get him either D20s or Dr Who ones. I am actually hoping to do a triforce clip for the bustle of my dress.